It is impossible to appreciate the magic of Toronto's Moss & Lam studio, just by looking at the building from the street. The space, which was until recently the warehouse for a printing company, is on the fringe of the city, across the road from where Lush manufactures soap (its signature scent heavy in the air). Outside, it's simple and unassuming – blending into the industrial surroundings. Carved plaster piece at Viceroy Dubai Restaurant. Inside, however, a team of 20 artists and designers meticulously creates fantasies of all sorts. On a recent visit, a painter with a massive brush on a 20-foot pole was painting an even more massive canvas in Turner-esque, sunset tones. The piece – warm and sublime – is destined to decorate a new Four Seasons hotel in Kuwait. On the opposite wall, across an airy, sky-lit room, hung a similarly large, floral canvas – this one pretty and delicate – that will soon make guests swoon at a five-star hotel in Boston. "I'm an artist at heart," says Moss & Lam's co-founder, Deborah Moss, who is as unassuming as the building that carries her name. Yes, she's an artist, but she's also a talented business leader. She has helped grow the studio from a low-ceilinged basement operation with her husband, Edward Lam, to what it is now: a mini-industry with dedicated facilities for woodworking, ceramics, and ceilings tall enough to paint the sort of massive murals that will soon grace the walls of ballrooms, lobbies and restaurants in Hong Kong or California. Since its founding in 1989, Moss & Lam has been the secret weapon of some of the world's best interior designers – including Yabu Pushelberg, Rockwell Group, Tony Chi and Peter Marino. It has helped to articulate their dreamy, often iconic spaces with paintings, sculptural wall treatments and mobiles that are at turns romantic, edgy or whimsical – whatever the character of the space requires. Moss & Lam's work graces both the highest-end locales – Saks, Nordstrom and Louis Vuitton stores – as well as more accessible, public spaces. A mobile for Ontario's Kitchener Public Library undulates through the atrium, looking like love notes caught in a gentle breeze. A mobile for Ontario’s Kitchener Public Library looks like love notes caught in a gentle breeze. 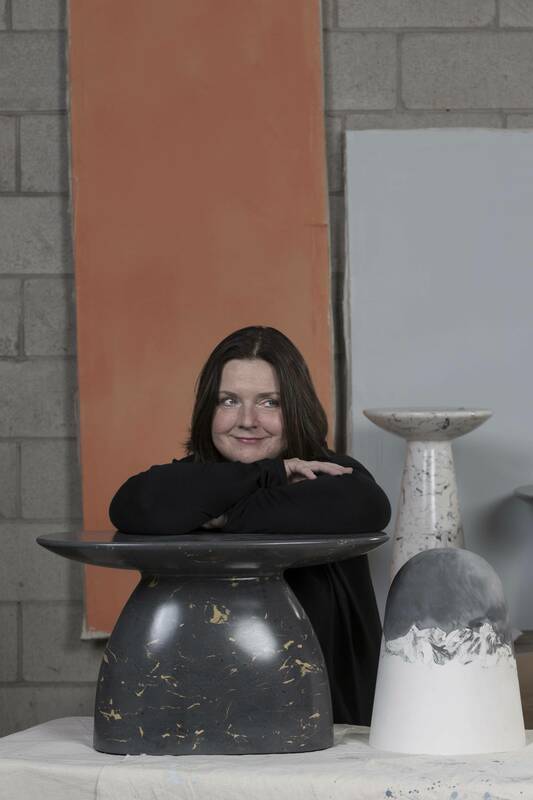 Despite having big-name clients, prodigious output and accolades (last year, the studio was honored with an AZ Award from Azure magazine for its W1 Tables, which are made using an ancient Roman technique for turning plaster, pigment and glue into a near-seamless facsimile of marble), Moss is characteristically Canadian in the way she operates – modestly under the radar. "In the past I thought about moving to New York," she says. "But I think there's a benefit to being here, and avoiding the pressures of the scene." Her achievements, though, are particularly impressive given that in 2013, Lam suddenly died of an undetected brain aneurysm, leaving Moss not only to raise their two young daughters but helm the business by herself. At the time, she primarily oversaw the creative end of the studio, then suddenly had to take over the whole operation. Many would falter under the pressure and the heartache. Moss pushed ahead. A mural at Saks Queen Street. In many ways, her new facilities, which replace a quaint if cramped workshop closer to downtown, are a testament to her strength and resolve. The new warehouse gives her and her team the space to try newer, bigger, more ambitious things. For example, expanding their private line of furniture and decorative objects, which are primarily sold through high-end retailer Avenue Road. "My kids said, 'Dad would be proud.' That meant a lot," she says. What drives her is simply the love of creating new things. The passion is evident in her studio, where plaster, ceramic and paint are clearly used with joy. Moss particularly likes things that are tactile, and made the old-fashioned way: by hand. "Could we get a 3D printer? Yes, but that doesn't interest me," she says. In her new studio, she has the time and space to explore her interests. The world will be a prettier place for what comes out. Editor’s note: A previous version of this article included an incorrect photo credit for a picture of the public library in Kitchener, Ont. It was by Henrietta Haniskova.